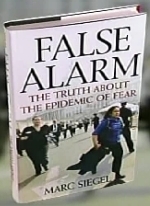 Author Marc Siegel was on "The Daily Show" last night, flogging his book False Alarm: The Truth About the Epidemic of Fear. I have not yet read the book, but his interview with Jon Stewart was troubling, to say the least. The cover photo is indeed taken from a true false alarm: the evacuation of the U.S. Capitol when a plane carrying Kentucky's governor bound for the Reagan funeral wandered into restricted airspace with a broken transponder. But the cause for the panic was genuine. On Sept. 11, 2001, Flight 93 was headed for the U.S. Capitol before it was taken down when passengers rose up against their terrorist hijackers. The Capitol has been evacuated a handful of times since, though one would be hard-pressed to argue that an alarm is "false" when it involves the potential of dying from a plane crashing into you. It was hard to tell exactly what Siegel's point was, but I'd try to sum it up this way: "We don't really need to worry about terrorism. Except for nukes. But we didn't find any nukes in Iraq, so everything is OK."
“We’re worried about the wrong thing,” Siegel said, arguing that we put too much concern into a "truck bomb versus a hurricane." But what if that "truck bomb" involved a series of coordinated attacks on levees? The end result would be much the same as Hurricane Katrina. "We have the whole country afraid of terrorism, which can happen to a few people and scare the whole country,” Siegel says. Call me silly, but I don't think 5,000 people murdered (and counting) by al-Qaeda qualifies as "a few" under most definitions. "They’re scaring us silly about everything," Siegel says, throwing “mad cow and West Nile” into the mix. “Our National Guard is over there instead of over here protecting against the disaster,” Siegel said. More leftist hyperbole. As James Robbins points out, only about 10 percent of the Army (including Guard and Reserve) is in Iraq, while nearly three-quarters is in the United States. Isn't it raising a "false alarm" to make such an overblown claim? JON STEWART: There clearly is a group of people who are organizing a network that is aiming to get large weapons to come over. Or am I reading that wrong? [SILENCE] You’re scaring me. MARC: You’re reading that right, but what I’m saying is that we can’t assume that everything that happens is a risk to all of us. The terrorists know that the biggest weapon they have is fear. They don’t have to hurt a lot of us. They get a few of us, and the rest of us panic. … That’s the elephant in the room is nuclear weapons. Finally we've found something that actually scares Marc Siegel: nukes. They don't have to hurt a lot of us, Marc, but anyone who has been paying even a little bit of attention since, oh, 1998 knows that they want to hurt, or kill, a lot of us. All of us, actually, or at least those of us who don't subscribe to their perverted religious fanaticism. JON: Isn’t that what we’re aiming to do, by taking on the terrorists where they live? MARC: I think that’s a global paranoia. I think when we went over there, we didn’t find those weapons. Marc, you just said "nukes" were the elephant in the room, then you called them "paranoia." Which is it? So just because we haven't found them in Iraq, do we ignore them elsewhere, like in Iran? Is it a "false alarm" to be concerned about countries like Iran with deep terrorist ties transferring those weapons to be used against us, or is it a legitimate concern? You're confusing me, Marc! Kerrey calls it "a terrific and groundbreaking book," while Corn calls it "masterful and provocative." (Anything that bashes life-saving pharmaceutical companies is OK by him!) While Press says, "Relax and put away your duct tape," precisely the kind of thing that explains his status as a former co-host of Crossfire. Look, Siegel has a point, but only to a point. If we're going to worry about things, we should probably prioritize between the trivial and the serious. But if his interview last night was any indication, his book sounds more like part of the left's ongoing campaign to hit the "snooze button" on terrorism than an honest attempt to delineate among the relative risk of things. Did I mention that Marc Siegel is a medical doctor and not a politician or policymaker? But at least he has given me a book idea: "The Doctor's Definitive Guide to Open-Heart Surgery." It is neither left or right. I am not minimizing terrorism, what I am doing is pointing out that it often – deliberately – scares beyond the actual damage. Let me know what you think after you read it.